Considering a bitcoin mining hardware purchase? Make a more informed decision with our Bitcoin Mining Dashboard. The bitcoin network hashrate estimate on bitcoinwatch.com passed 1 exaFLOPS (1,000 petaFLOPS) this week – over 8 times the combined speed of the top 500 supercomputers. 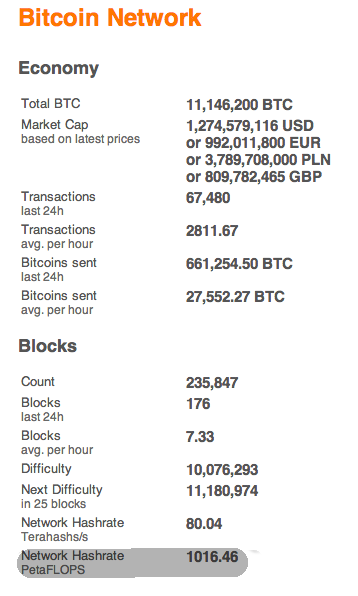 Experts will be quick to point out that this estimate is flawed, since no FLOPS are actually used in bitcoin mining. FLOPS stands for FLoating-point Operations Per Second, and is frequently used as a standard to measure computer speed. Bitcoin mining uses an integer calculation and almost no floating-point operations, so converting bitcoin network speed to this standard is somewhat clumsy. The FLOPS estimate is based on the opportunity cost of computers using their hardware for mining instead of other applications. Miners are using their graphics cards to perform hashes instead of other FLOPS-based distributed computing. Therefore, a conversion rate of 1 hash = 12.7K FLOP is used to estimate what this hardware could be doing. The estimate was created in 2011, before the production of ASIC hardware that now dominates the network. ASICS are custom designed chips that can only perform bitcoin mining calculations. The exaFLOPS estimate breaks down with ASICs, because they are not capable of floating-point operations, and therefore there is no opportunity cost associated with their use. Interestingly, the estimate may still be useful for estimating how well other supercomputers and distributed networking projects would be able to mine bitcoins. Their speed is measured in FLOPS, but they also have the capability of performing the integer operations used in hashing. 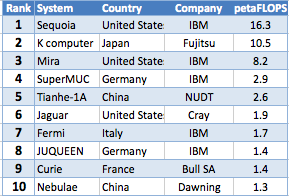 What would happen if the top 10 supercomputers all switched to bitcoin mining? How much would that affect the network? Lets reverse the equation, and say that they would receive 1 hash for every 12.7k FLOP. The fastest computer, Sequoia, would measure at about 1.6% of the bitcoin network. 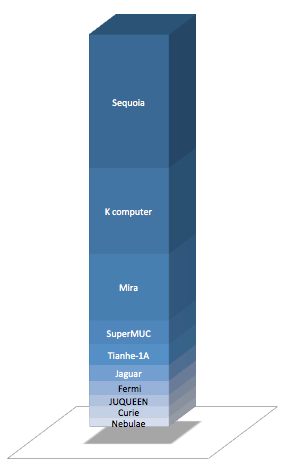 Their combined speed is 48 petaFLOPS, roughly equivalent to 5% of the bitcoin network. In fact, the top 500 supercomputers have a combined speed of 12% of the bitcoin network. To actually use these computers for mining, It would take more than just installing standard mining software. But lets be honest, these computers have better things to work on like curing cancer, solving global warming, and monitoring banking transactions.